Well, On The Other Hand . . . So, I don’t remember if I told you all, but over the past year or so, I’ve been teaching myself to write with my left hand. I didn’t call it my non-dominant hand, since I’m not entirely sure that I have a dominant hand. And if I did before now, I don’t think I do much anymore. See, my hands can do certain things on their own, and occasionally together (when they’re in the mood), but there’s not just the one hand that does everything. First off, I play french horn, yes? It’s a left handed instrument. Second of all, I wear my watch on my right arm and have for nearly as long as I can remember. It’s easier to put my watch on with my left hand. The reason that I really decided to go for it this time was partially an effort to stay quieter as a way to appease the finch (not to be confused with the wench, since there isn’t one at present). At first it took me longer to take my notes left-handed; therefore I was occupied longer than before and my mind wasn’t as free to think up interesting questions. So then I took notes left-handed through all of my summer stats classes (I took 1 and 2). And then I got a job where I do a fair amount of writing. And . . . yeah. So it goes. I got a tablet for Christmas from my dad (thank you thank you thank you); which for those of you who might not know, is a way of drawing or writing directly onto the screen of your pc/mac etc. And this way you don’t have to wash it off afterwards either. Bonus! 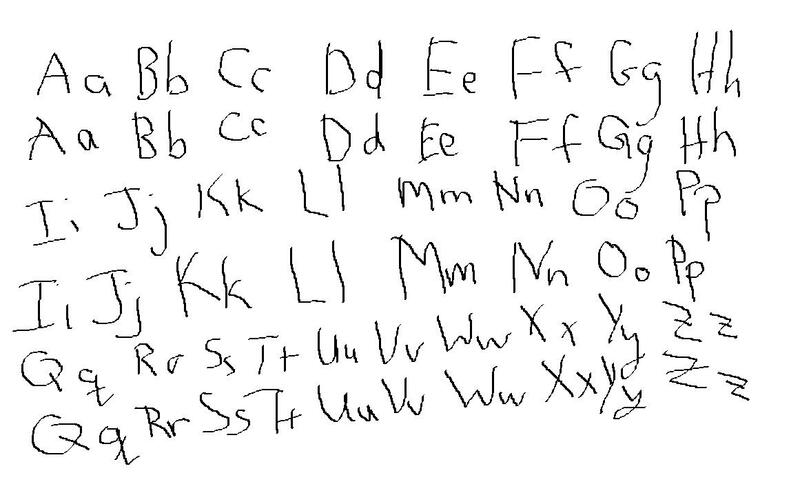 The picture that you are about to see is a handwriting sample from both my right and left hands. Each was written in nearly the same length of time. Which is which? ~ by lastcrazyhorn on January 18, 2009. Well, I wouldn’t call block-lettering “handwriting”, exactly. They did teach you cursive in the third grade, right? 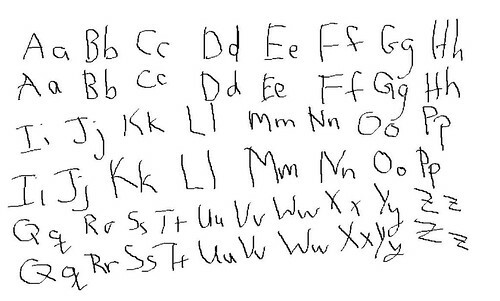 That’s a great neurological exercise, teaching both hands to write. I’ve got some ambidexterity going on too (or, ‘failure to demonstrate hemispheric dominance’ as it’s called in the medical literature! lol!) Never underestimate the usefulness of being able to write down two things at once. Reading upside down is another one of those weird skills that comes in surprisingly handy! To veer the thread a bit, J.B.S. Haldane taught himself to speak while inhaling. This meant that when he was on a roll, talking at you, he would never shut up, and you _really_ couldn’t get a word in edgewise. You mean there are people who can’t read upside down? Meep, are you the same Meep who is Mary Pat the Actuary from Math Camp? Oh, I have deliberately refrained from practicing writing with the weak hand, so as not to have any samples lying about. I mean, someday I might wish to write a ransom note, or a smartass letter to a government person, etc. and if the one and only example they have looks like it was laboriously lettered by an un-co-ordinated first-grader, well, they’ll just have to earn their pay when it comes to looking me up.